REWARDED: Killarney Co-Op Home Hardware manager Bruce Halter, with general manager Marissa Costello and Home Hardware Queensland manager Oliver Krumins. WHEN the Killarney Co-operative Dairy Association formed almost 100 years ago its initial 41 shareholders had no idea it would evolve into a one-stop community hub. What started as an ad hoc butter factory in 1921 has grown to include a FoodWorks supermarket, a Better Home Living furniture store, a CRT rural traders, a petrol station, a show shop and Home Hardware store. All the while it kept its co-op structure, expanding the first offering of 41 shareholders to more than 2000 today, most of whom live in Killarney. 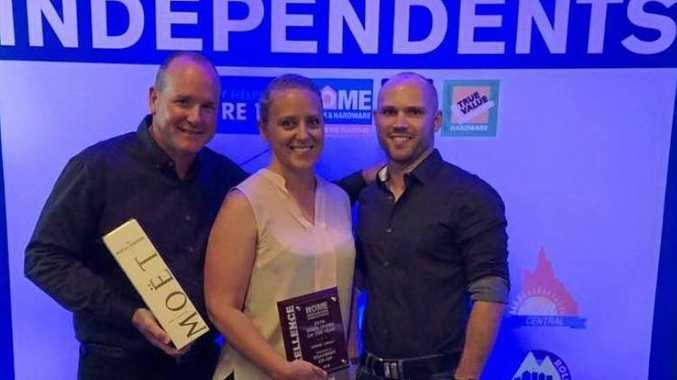 It is a focus on retail as a community service that led to the hardware wing of the co-op winning the Home Hardware Queensland Best Store under 1000sqm about two weeks ago. Manager Bruce Halter said the award would not have been possible without the community's support. "It's judged on store appearance, sales and overall growth," Mr Halter said. "We have been growing consistently over the past four years. "I think that growth is a fair bit to do with offering good service but also more people have moved to the area and there is an increase in tourism. "There is new people moving here all the time and they are renovating their homes." In the early days retail was an off-shoot of the butter factory but when production closed in 1974 the co-op shareholders knew they had to expand. Its general manager Marissa Costello said today's directors looked to support the town. "There are a lot of co-ops around but we are fairly unique in the diversity of our business," Ms Costello said. Unlike in other corporate governance structures, votes in a co-op are limited to one per shareholder and not tied to how may shares a person owns. Importantly, you need more than cash to buy in. Potential shareholders must either be customers or suppliers to be eligible for shares. Ms Costello said this relationship with community allowed the co-op to take a punt on services that would otherwise leave town or take a loss. "We're always looking for what is maybe needed in the town so people don't have to leave Killarney," she said.